Winter's seasonal dog health problems loom now that the weather is turning cold, meaning we must watch out for sick dogs and winter hazards that could affect our beloved pets. Antifreeze is a wonderful tool for getting your car ready for the winter months, but it's deadly for your pet. To make matters worse, antifreeze has a sweet taste and smell, so dogs are highly attracted to this substance. Ethylene glycol is the component in antifreeze that cause sick dogs, making it a major winter hazard. If you suspect your pet has ingested antifreeze, call your veterinarian immediately, or get your pet to the nearest vet clinic. Caution is the key to preventing dog health problems resulting from this harmful poison. Do not allow your pet in the area where you store antifreeze. Wipe up any spills from the antifreeze container or your car. Windshield wiper fluids also contain methanol or ethylene glycol, the toxic ingredient in antifreeze. Many plants associated with the holidays are harmful to our furry friends. This means sick dog winter hazards can put a real damper on your holiday festivities. 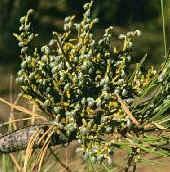 Mistletoe - You may want to kiss your beloved under this parasitic plant but keep it away from your pooch. Mistletoe can cause diarrhea, vomiting, shock and death within hours of ingestion. Poinsettia - Many families decorate the hearth and home with this colorful Christmas favorite, but if you have pets, you may want to decorate with the artificial version. While research has been done that shows this plant is not as harmful as once believed, it does produce an irritating milky sap that is harmful when swallowed. Holly - The leaves and berries of the holly plant are harmful if swallowed. Signs of ingestion include nausea, diarrhea and vomiting. *Lilies - These plants can cause irreversible kidney damage. Chocolate - Chocolate is abundant during the holiday season when everybody is baking for friends and family. While all types of chocolate are hazardous to your dog, baking chocolate is the most lethal. Baking chocolate has the highest concentration of theobromine, an ingredient in chocolate that is hazardous to dogs. In high doses, chocolate causes epileptic seizures and death. Coffee - Liquid coffee, coffee beans, espresso and other coffee products are harmful. The caffeine in these products does not react with a dog's system the same way it reacts with a person's system. Caffeine causes seizures, diarrhea, erratic heart rates and death in canines. Macadamia nuts - These nuts, often found in cookies around the holiday season, cause muscle weakness, tremors, and vomiting. Yeast dough - The ingestion of raw yeast dough can lead to serious alcohol intoxication due to the fermentation process. The rising of the dough in your dog can also cause bloat, a potentially deadly disorder. Hypothermia - If your dog is left outside for any extended period of time during the winter months in cold weather climates, be alert for signs of hypothermia. Hypothermia is a severe drop in body temperature. If you suspect your dog may have hypothermia, wrap him up in a warm blanket and bring him inside. A warm bath may help as well. Frozen Water Dish - If your dog's water is left outside in the cold, chances are the water in his water bowl will freeze. Without fresh water, dogs can dehydrate. Exercise - Pets, like people, tend to get less exercise in the cooler months. Create indoor activities you can perform with your pet to keep you both in shape. Awareness is half the battle when preventing a sick dog and winter hazards correlation.